In a Good Oxfordian/Bad Oxfordian chapter of his book, William Farina willingly ignores the Oxfordian dating argument and goes out of his way to accept the 'orthodox' view of Two Gentlemen of Verona. In fact, there is no conventional dating for the play. It has to be written before Francis Meres' mention of it in Palladis Tamia in 1598 but stylometry is the only way to attempt further precision. Many Oxfordians want to date this play 10 or 20 years earlier to make the timeline fit De Vere's death before a third of plays were written and the absence of hard evidence means that not much can be done to contradict them, other than argue matters of style, construction and vocabulary. navigable by small craft for long distances. There is no route from Verona to Milan, however, now or then. This could be because there weren't many performances and the reason for that might be that the Elizabethan audience wasn't all that keen on what is clearly one of Will's earliest works, something humorously hinted at in the audition scene of Shakespeare in Love. However. Most people think the play was written around 1590. Farina graciously sees no reason to disagree. The precision Farina is trying to achieve is the tying of lots of detailed little geographical knots to advance the cause that it can only have been written by someone who has visited Italy. So Good Oxfordian cheerfully concedes any and all points about when the play was written. It isn't a subject dear to many hearts on either side of the debate. Bad Oxfordian invents a network of canals in 16C Italy to support the fact that Shakespeare's characters sail from Verona to Milan or Mantua, three inland cities, making threats of throwing each other overboard on what would clearly have been an overland trip. There have been canals in Italy since Roman times but none that will allow any of those journeys without first sailing east into the Adriatic. 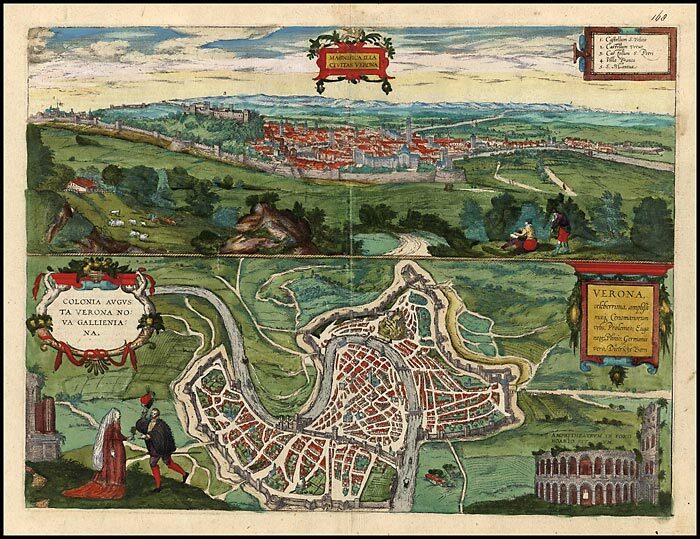 There are quite a few other titbits of geographical information which are both accurate and counter intuitive, The Ducal palace, correctly located in the play, is not inside the city walls, for instance. There are other similarly accurate details but absolutely none which are outside the content of the play's source material. So unless one successfully argues that Will didn't read the source material, one can't conclude that he went to Italy. This is all rather silly as the story goes back hundreds of years to the Decameron and even Oxford must have read the source material. So travelling to Italy does not give The Earl any advantage in the question of who wrote this play. Furthermore, there are some crucial pieces of counter evidence. In the play, Verona has a Duke, as it did when Bocaccio wrote his version of the Proteus-Valentino-Sylvia thread. When Oxford visited, it hadn't had a Duke for over a century. Ooops. The key disputed geographical references are made to hurry the characters about to avoid 'missing the tide'. The Thames has a tidal range of some 18 feet and its level moves up and down so rapidly that Elizabethans could use it to measure elapsed time. The Mediterranean has no diurnal tidal range to speak of so its rivers have no tides to miss. No one who has been on a Mediterranean beach or Ligurian riverside could write that line. Worst of all, anyone who has been to a performance without first reading the play will know that it is hard to keep track of where the action is supposed to be taking place. The author doesn't really do a good job of separating Mantua and Milan, for example. Nor does it matter. An Italian backdrop was simply a way for the Elizabethan dramatist to work inside a well-accepted genre. Italian locations meant all manner of duplicity, cruelty, sword fights and mayhem without anyone in the audience having to feel guilty as it was all taking place somewhere else. Somewhere quasi-fictional. Italyland. Just as no one in the cinema cared much if the cemetery moved from one end of Cheyenne to the other in the course of a film's action, no Elizabethan groundling cared if the Brenta Canal went to Verona or Valencia and no one cared how far the River Po was navigable. It didn't matter, then. It doesn't matter now. Shakespeare knew enough about Italy to set plays there. And knew enough about his audience to understand why it was a good idea. Italian plays were good box office. So he and all the other Elizabethan dramatists got the books and atlases out and did their homework.